Language is our tool for communication. We can use it well, or we can use it badly, but it is something we create and use, a democracy of sounds and scribbles. We're seeing increasing attempts by big business to change all that. Spend enough money and you can make common words illegal. I was horrified to read about this in connection to the Olympics: The Independent, Marketing Week, Examiner and so on have all covered it. More commentary here, here and here. We've already had companies branding common words, taking ownership of them. Now we are seeing tentative attempts to ban use of common words to protect commercial interests. I recently read about an author whose children's fantasy novel included animals setting up the 'animal olympics'. 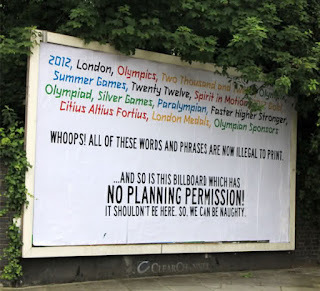 He was told he would have to use a different word than 'olympics' because of the threat of litigation. Since when did a group gain ownership of an adjective for a place - Olympia - where games were held before corporations existed? "Don't you see that the whole aim of Newspeak is to narrow the range of thought? In the end we shall make thoughtcrime literally impossible, because there will be no words in which to express it. Every concept that can ever be needed, will be expressed by exactly one word, with its meaning rigidly defined and all its subsidiary meanings rubbed out and forgotten." A quote from Chapter 5 of George Orwell's amazing and terrifying novel, Nineteen Eighty-Four. I also object to the way motivations are being blurred by language. Big companies sponsor things for the publicity, the marketing potential, to distract attention from their dubious activities and controversial profiteering, to gain tax breaks and so no. However, they claim they are doing it because they out of altruism. That is clearly untrue. Altruism does not call attention to itself. If sponsoring companies are foghorning their money-splashing from every lamp-post then their motivation was in order to gain recognition, not out of goodwill. And that is why there is this clampdown on the use of words (and even bans on products that compete with sponsors e.g. 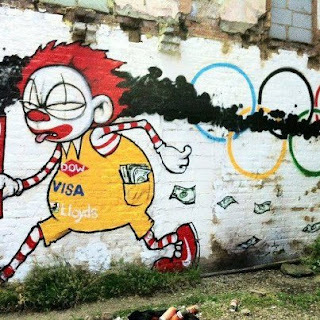 Visa, McDonalds). I certainly won't be supporting the toxic junkfood Olympics. Apologies for the rant, but I had to get that off my chest! True, Karl, I find it horrifying as well. When the telecoms company Orange came out with that brand name, it was a cute idea. Every time we saw the colour orange we'd think of Orange! Then I read it was trying to ban companies from using 'Orange' as part of their brand names. How long before the term 'the' is copyrighted so whenever we use it we must place a TM behind it?